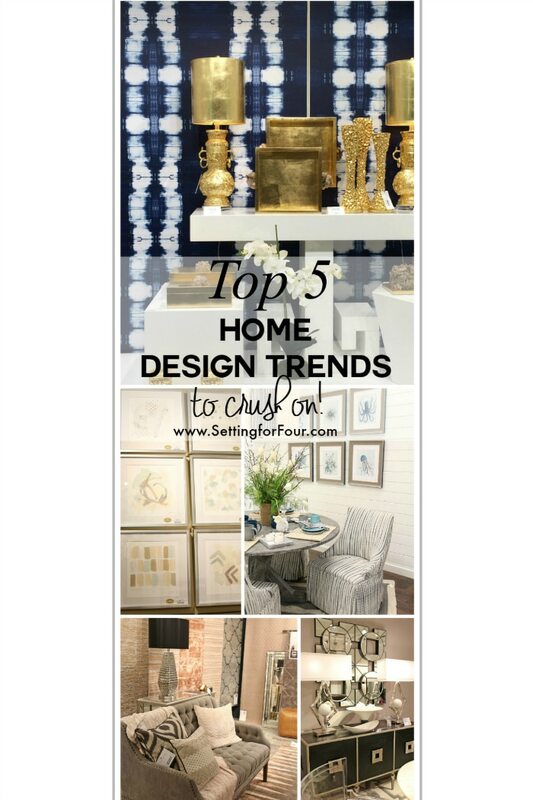 I’ve scouted the International Gift and Home Furnishings Market to find the best home design and decor trends – it’s all here in my trend report ‘Top 5 Home Design Trends to Crush On’! Come see! Being a blogger and Setting for Four have certainly taken me on some incredibly exciting journeys along the way; pinch-me experiences that I’m so thrilled to have been a part of and grateful for! Being asked to be a Trend Scout for the inaugural #StyleYourSeason tastemaker program with AmericasMart Atlanta, to preview the sensational International Gift and Home Furnishings Market and select my top design trends for 2016 is certainly one of the most fun and rewarding experiences I’ve had as a professional blogger, as an Interior Decorator and as a lover of meaningful home design and decor! 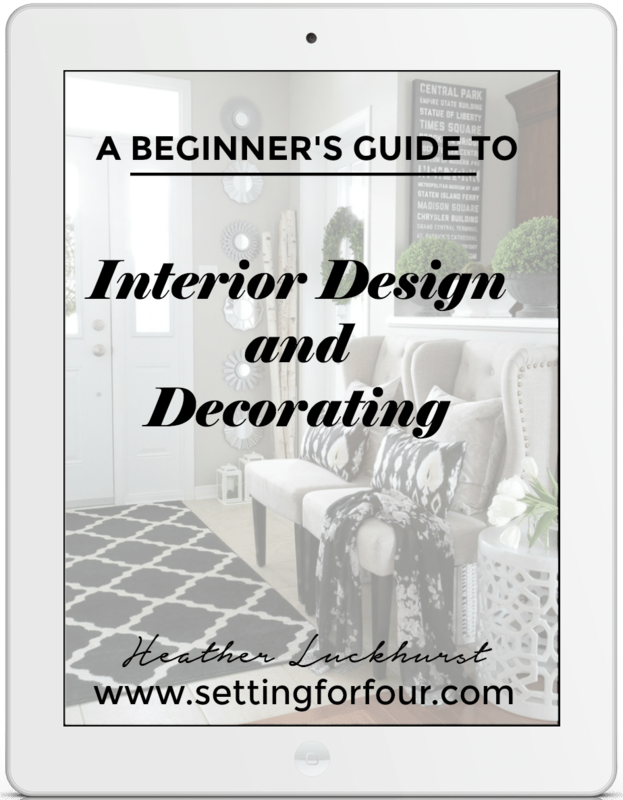 I scouted the newest products and design trends in the interior design world as well as tour the showrooms and exhibitor spaces of the top home furnishing, decorative accessory and gift brands from around the world! And today I’m sharing with you the Top 5 Home Design Trends to crush on! I scoured the Market for three days (and much of it’s 7 million square feet!) 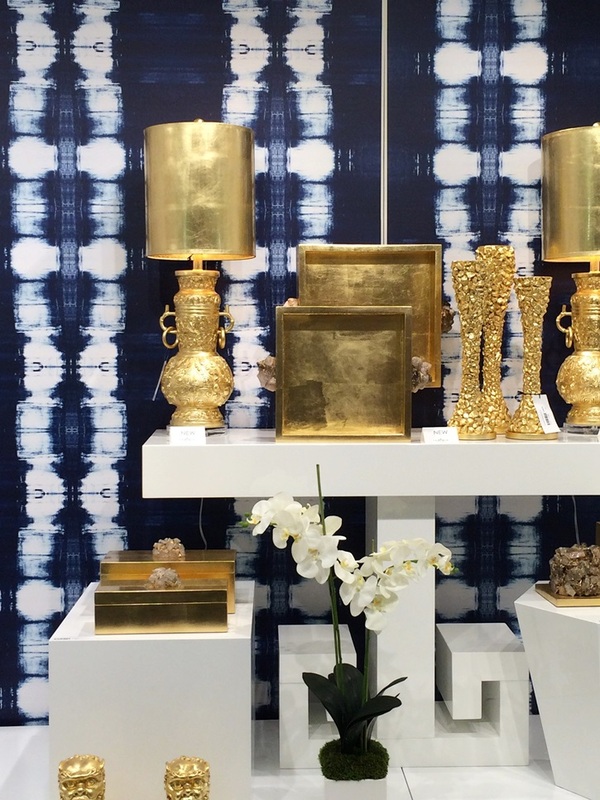 curating the top design trends that will shape our interiors in 2016, discovering fascinating designs that were showcased in dazzling vignettes and visual displays. 1. Rose Quartz Rapture: Gentleness, compassion and composure – these are all the sentiments and sensations that Rose Quartz, the blush hued Pantone color of the year 2016, evoke. I predict Rose Quartz will be a big trend we will be seeing a lot more of this year ranging from wall colors to textiles and hard surface materials. These stunning area rugs from Jaipur demonstrate how Rose Quartz joins easily with other colors such as taupes, whites, greys and materials such as wood and leather. Adding one of these rose quartz hued area rugs to a room will instantly create a warm, inviting space. 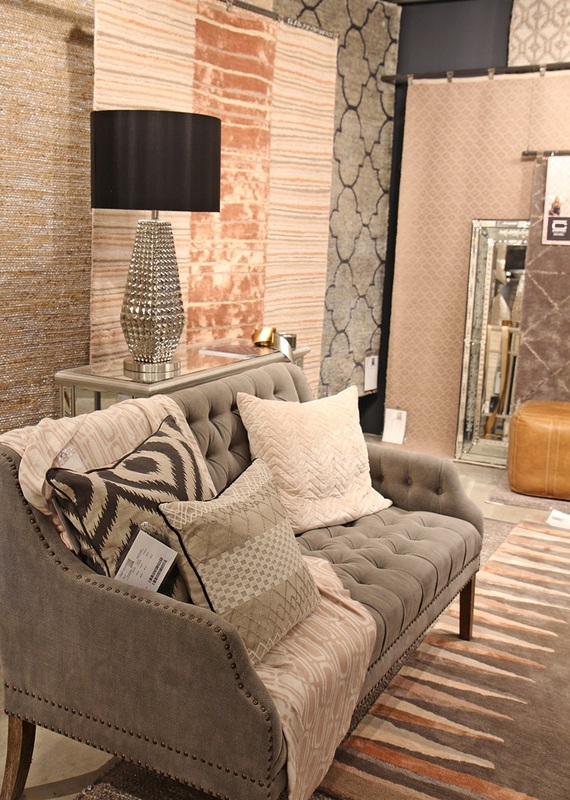 When layered with metallics these rugs create an aura of quiet luxury. 2. Black And White Embraces Metallics: Black and white is a classic color duo that has been around forever but in 2016 this go-to palette forges an exciting design trend as a result of its combination with metallic finishes. Adding silver, gold and aged bronze metallics transforms a monochromatic ebony and ivory palette into an edgy, cosmopolitan look. The result is dramatic and vibrant, the perfect recipe to uplift our moods and add excitement to our mundane day to day routines. Global Views showcases this look by layering an abundance of black and white with silver metallic finishes. 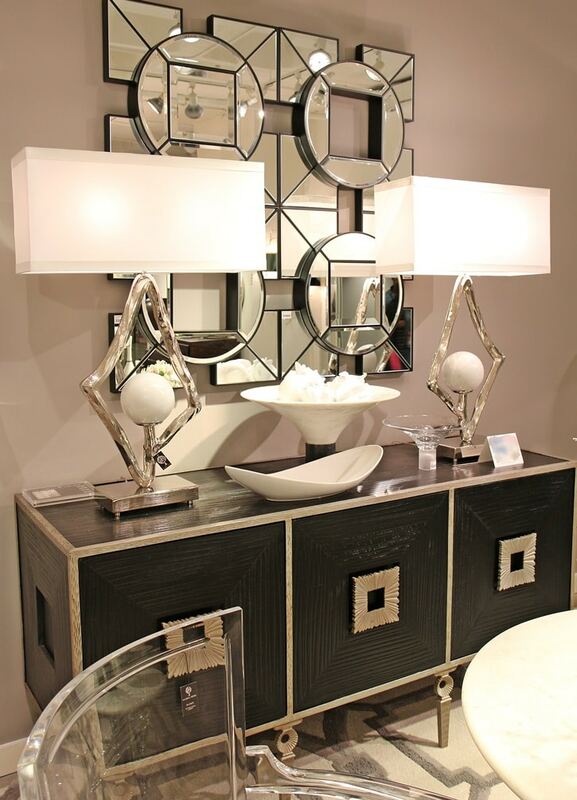 I love these nickel and black iron based table lamps topped with ivory silk shades and white marble sphere accents. They look stunning on top of a black wood and silver iron framed media cabinet. So elegant! 3. Serenity and Beyond: The weightless and airy aura of Pantone’s other color of the year 2016, Serenity, is one that I personally deeply connect with. Growing up on the shores of a sandy beached lake this color reminds me of lapping waves and watery relaxation. For 2016 Pantone has paired it with colors such as navy Snorkel Blue and aqua Limpet Shell reinforcing that blue hues such as Serenity are a design trend we will see more of in the coming months. This room by Imagine Home ties handcrafted artisan textiles with Serenity as well as lighter and darker blues to create a tranquil, relaxed space that invites us to take a pause in life and enjoy some quietude. 4. Soft Focus: With the advance of technology in this informatics age, we’ve been bombarded with electronic information, data and analysis. 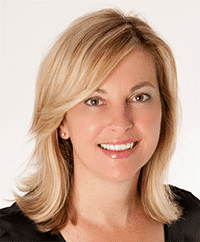 This combined with the unstable times in the world we live in, ‘the politically clashing of ideas and our hurried lives has resulted in us losing connection for ourselves” says Laurie Pressman , VP of the PANTONE Color Institute. To remedy this we will be adding soft palettes to our interiors in 2016 to create the calm, serene environment we crave. Muted and quiet, these pastel colors include the washed neutrals of Pantone’s Rose Quartz, Serenity blue, hushed grays and taupes mixed with soft greens and yellows. It’s time to unplug and these soft palettes aim to create the relaxation and peaceful contentment our minds and spirit savor. 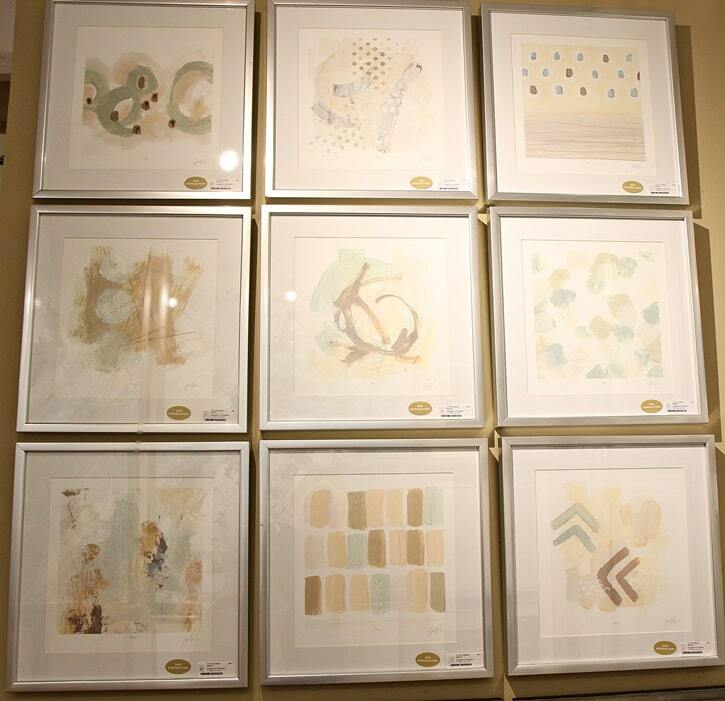 These muted pastel colored prints from W. King Ambler are a fabulous way to introduce this soft palette trend into our homes and tap into our inner Zen. These prints combine sophisticated hushed hues with a playful graphic mix of patterns. Hung in a gallery wall layout they will create the perfect vibe of calm and airy tranquility we are seeking. 5. Shibori Scene: It’s true that the world really is getting smaller and we are embracing global influences for our homes for 2016. In particular the art of indigenous hand dyeing techniques is a design trend that was showcased at AmericasMart ranging from upholstery to wall coverings. These artisnal patterns embrace both the handmade craftmanship and the connection to the ‘maker’ feeling we want in our homes for 2016, to balance all things mass manufactured in our lives. This stunning Japanese Shibori style indigo wallpaper at CODARUS perfectly embodies this design trend. This wallpaper can instantly send a traditional or modern dining room from ho-hum to cool and chic. Copy this vignette’s look and add gold metallics to create the worldly and curated look of an adventurous, well-travelled life. All in all my top 5 design trend predictions for 2016 embrace tranquility, well-being, creativity and serenity. They foster feelings of reassurance in the uncertain, turbulent times we live in and a balance to all of the ever-evolving technology in our lives. I look forward to the reflection and feelings of wellness these 2016 design trends will beautifully infuse into our interiors and our lives! 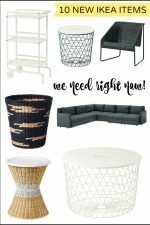 I had so much fun scouting the top home design and decor showrooms featured at Market this year! I have lots of styling ideas from my trip and will of course share them with you – stay tuned! I hope you enjoyed seeing my Top 5 Home Design Trends to Crush On! 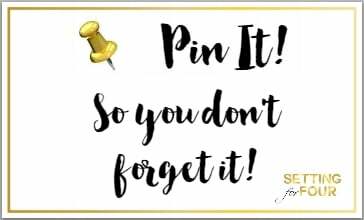 Don’t forget to Pin this to your home decor board and see all of the decor ideas I’m pinning here! I’m glad the metallics and mixed metal finishes are here to stay! I am in love with that coastal pic featuring shades of serenity and navy. That is a trend that seems much more practical and liveable for a broader scope of people vs. rose quartz. Glad to see I’m right on trend too! 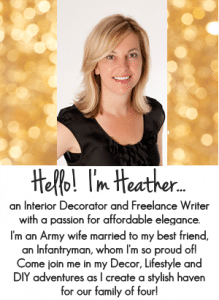 What great info Heather… of course I’m loving the beachy tones too! Love all these idea, thank you for sharing. I adore those mixed textiles and swooning over the metallics! What a great trip to make! I’m really into Navy right now so I’m loving that indigo wallpaper, beautiful! Love the rose quartz and of course the black and white meets metallic!! 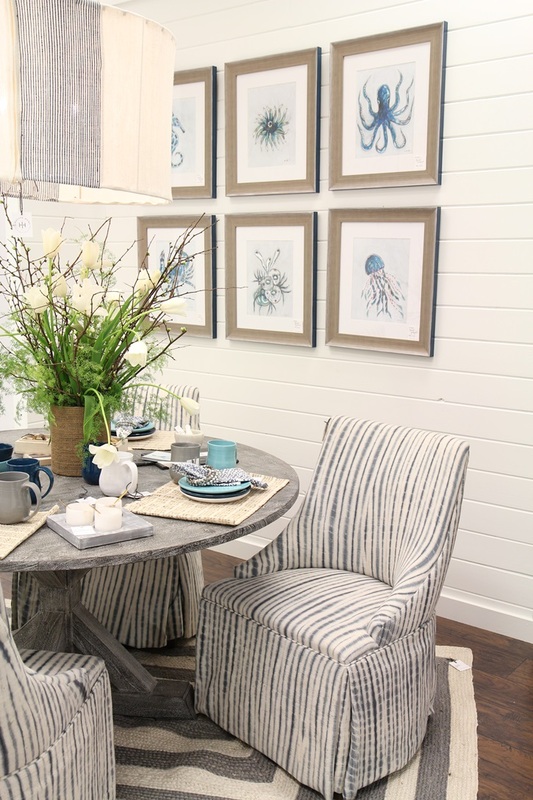 Those blue and white dining chairs are to die for!! 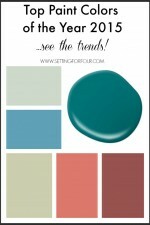 I love all your trend picks you rounded up! Thanks Sarah – those dining chairs are gorgeous! Glad you like my trend picks! Gorgeous textures, styles and colors. The rose quartz has my heart. Simply srunning. 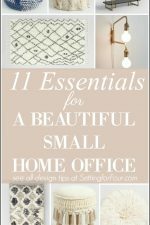 Thanks Meegan – I’m crushing on rose quartz too! Visiting the Mart is on my bucket list! You certainly scouted out some great decor trends. I’ve never really been a “blue” person but love the combination of the light and dark blues together. Looking forward to seeing more of your styling ideas! You should go Jane – you would LOVE it!!! Thanks for your lovely compliments!